Artificial intelligence is generally defined as a branch of computer science which helps in creation and development of intelligence machines with the ability to work as humans. According to market research reports , the types of Artificial intelligence can be classified as Weak AI, Strong AI, Artificial general intelligence and Super intelligence. Growth in Data Accumulation: Due to increasing connectivity of large number of smart devices around the world, vast volumes of unstructured data have been accumulated. As higher the amount of data gets collected, higher level of problems could be solved more accurately due to advent of neural networks, deep learning and machine learning, which could not be solved previously due various factors. The following figure illustrates the estimated growth in amount of data generated from 2016 to 2025. Reducing Capital Expenditure: Decreasing cost of computing Power and increasing suitability of GPU’s to run massive computation has resulted in reduction of time of performing complex calculations from several days to less than a day. The following figure illustrates the leading service vendors across various AI sectors. Artificial Intelligence can be used in different sectors such as Agriculture, Retail Industry, Financial Services and Energy to name a few. 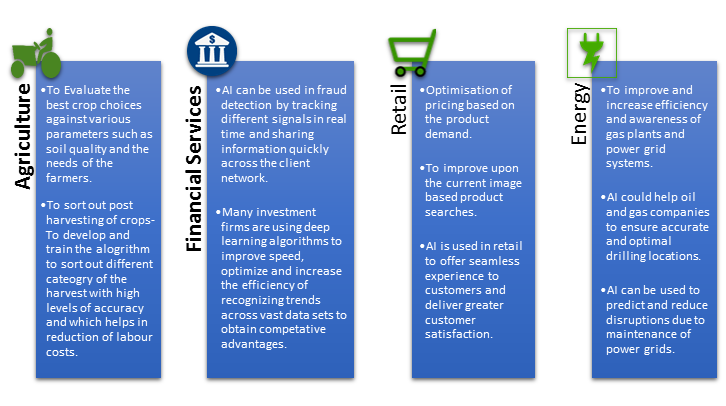 Important use cases of AI in different areas are illustrated below.